The Reynolds Alberta Museum (RAM) has been attending and competing in the National Association of Automobile Museums (NAAM) awards program since 2006. The wall in the museum that displays a variety of awards they have won over the years will become much more crowded this year. RAM returned home with 3 new awards. The 2014 Annual conference was co-hosted by NAAM and the World Forum for Motor Museums at the Petersen Automotive Museum in Los Angeles, California, March 24 – 28, 2014. RAM ranked very high in the standings. 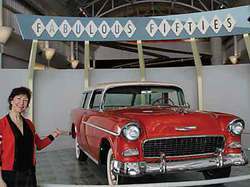 Interpretive Exhibits for The Fabulous Fifties Exhibition received 70 of a possible 75 points, The Spirit of the Machine! Volume 1 received 72/75 points and The Fabulous Fifties Catalogue, 70/75 points. The judges ranked almost all of the categories as ‘Excellent Masterful’ and most others were graded as ‘Above Average, Memorable’. The annual NAAMY awards competition honors the work of non-profit automotive transportation museums. Winning the awards is a prestigious honor and represents a commitment to excellence. The awards recognize industry leaders for achievement, professionalism and creativity. The promote professionalism in automotive museum managerial, curatorial, educational and promotional work. “The conference and competition provides international exposure to the Museum and Wetaskiwin. Through the conference we have established and built respect internationally and could position us to be a future site for the conference.” About 50 delegates from countries like U.K., Japan, Australia and Germany attend the conference. The era was known as the fabulous 50’s. The second World War was over and the country was experiencing significant economic growth through the demand for new goods and services. Consumers were purchasing telephones, household appliances, radios, automobiles and the ‘all new’ television sets. It was a period of economic boom that followed World War II. Life was quite different in the 50’s. Family values were highly respected. Families dined together, met with neighbours in their homes or at community events and most attended church regularly. Elders were shown respect. Children could roam and play in safe neighbourhoods There were no computers, live-in relationships were frowned on, men were the bread earners and females were expected to be stay-at-home house wives, not wage earners. It was the era that introduced youth to Elvis Presley and rock and roll. Marilyn Monroe was an icon. Clothing changed. Boys were wearing jeans and leather jackets. They grew their hair longer and slicked it back with grease. Girls wore pedal pushers, scarves and skirts, ponytails. Youth began to experience more freedom. It was becoming increasingly difficult to have children who were ‘seen but not heard’.